We have a collection of devices for measuring the very small extensions which occur during testing. There are (obviously) known as "Extensometers". The machine is single-acting water hydraulic powered and has a designed load capacity of 1,000,000 lb - 446 UK tons – 500 US tons at 6700 psi. The actuator is 18 inch diameter and 6 ft stroke. Samples up to 20 ft long can be tested in tension or compression, and up to 26 ft span in bending. Crushing, shear and torsion tests are also possible. 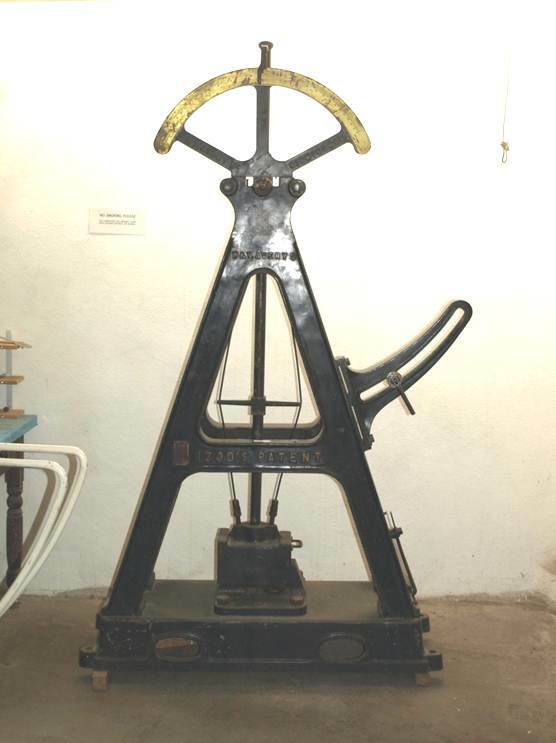 This tension-compression machine was made in Philadelphia PA by the Riehle Bros in about 1890. It has a very compact compound-lever force measurement system and a force-displacement recording drum. The machine crosshead is screw-driven with provision for 2-speed hand or power drive from overhead lineshaft. 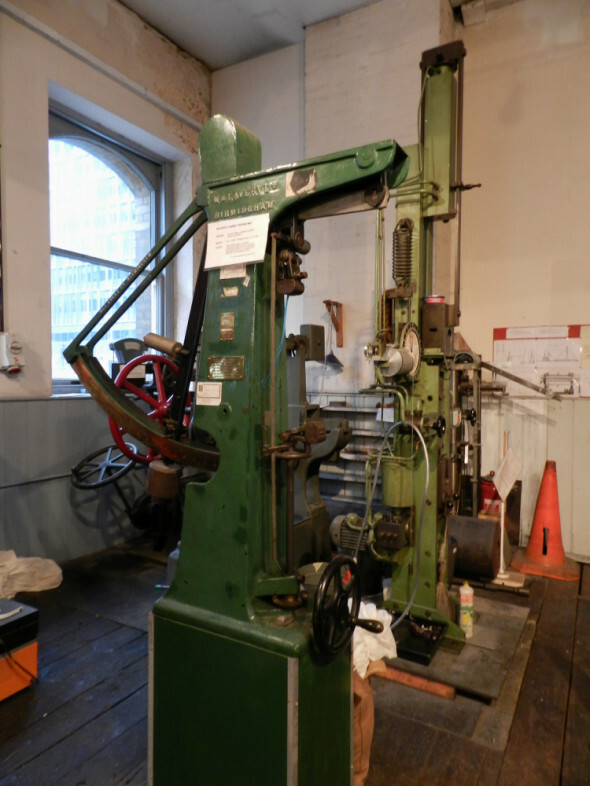 It worked in the Mechanical Engineering Dept at Imperial College London from new until 1985, and was then donated to the Kirkaldy Museum. 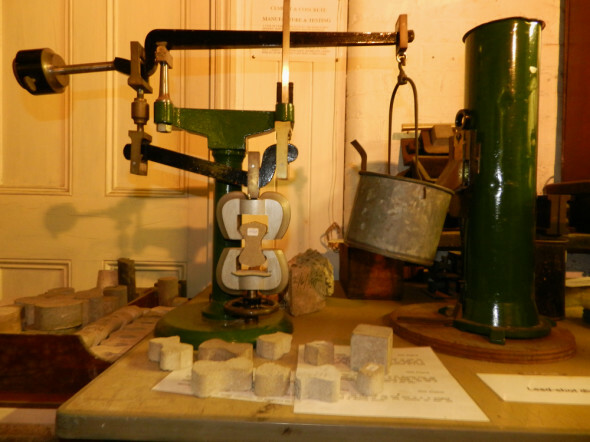 Visitors can have a go at crushing a concrete cube on this machine. 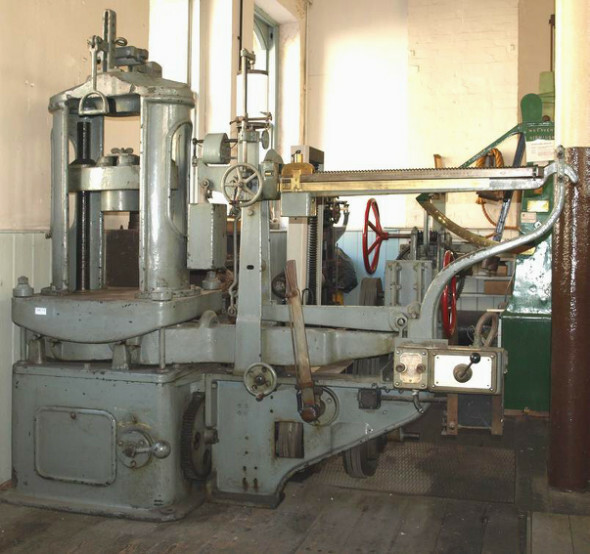 This picture shows in the foreground a small Avery machine dating from 1926 and behind an Amsler vertical machine from the 1960s. Both were donated to the museum from a parachute company where they were used to test such as things as lines and webbing. The Avery is purely mechanical and hand operated, whereas the Amsler is oil hydraulic with a motor driven pump. 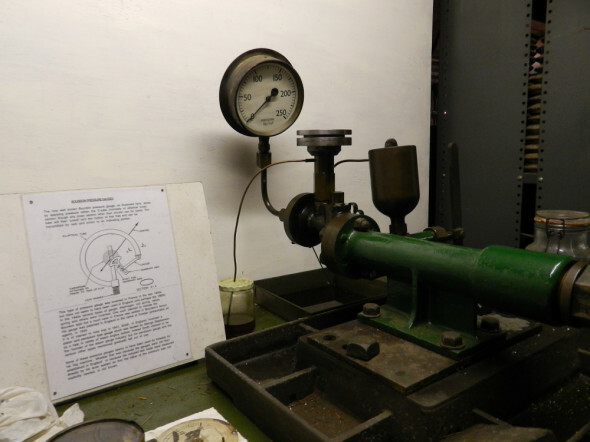 Impact testing is used to determine the behaviour of materials under shock loading. We have an Izod type machine. 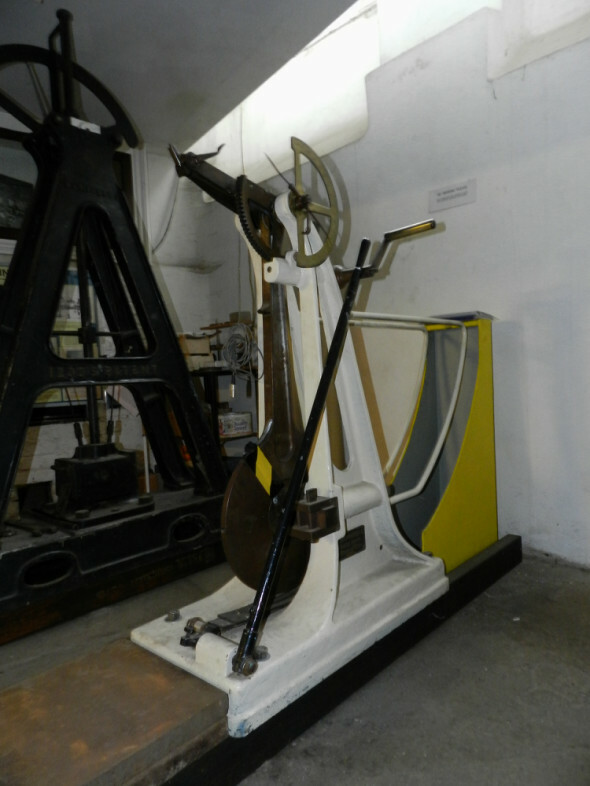 This French Charpy machine was made in 1916 and spent all of its working life at Imperial College. It came to the museum in full working order. It is believed to the oldest such machine is existence. The Brinell machine uses a steel ball indenter. This is applied to the surface with a specified force for a given length of time, the size of the hemispherical indentation is then measured. A formula is used to determine a relative hardness value. 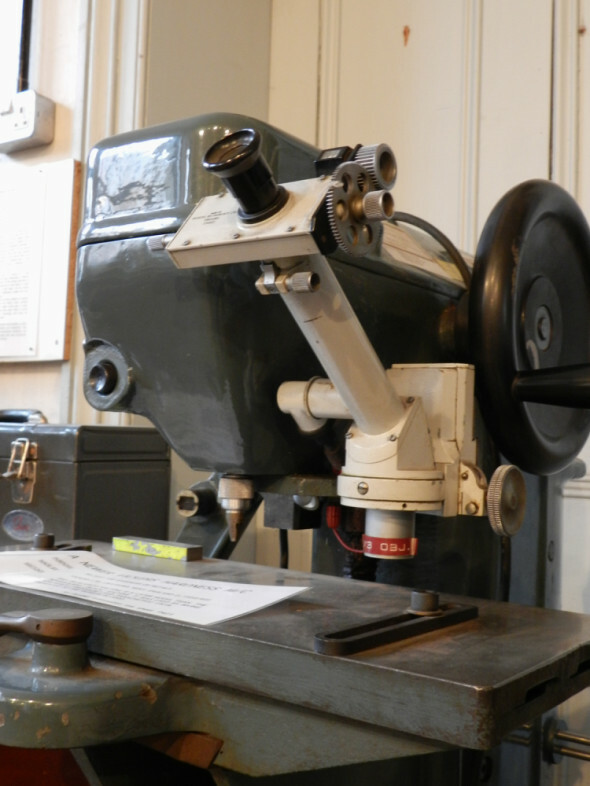 The vickers machine uses a diamond point indenter in the shape of a pyramid. As with the Brinell this is applied to the surface with a specified force for a given length of time, on this machine electrically controlled. The size of the indentation is then measured. It appears as a square under the microscope so the distances between opposite corners are measured. A formula is used to determine a relative hardness value. This machine is for tesing the quality of cement. The cement is used to make a small dogbone shaped briquette with a central cross section of 1 sq inch. This is clamped into the machine and subject to a load in tension by running lead shot into the bucket from the tall green bin on the right. When the dog bone breaks the lead shot bucket is weighed to give a direct measure of the force required. 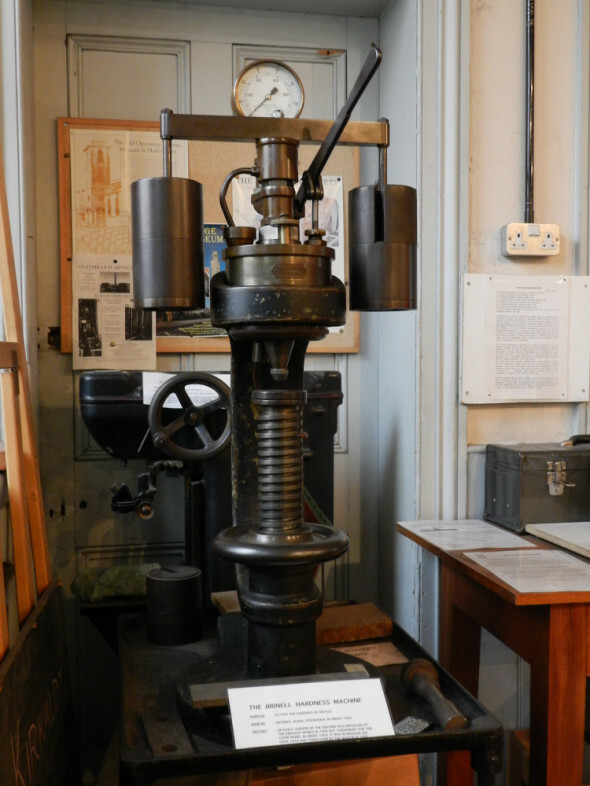 This device is for checking the accuracy of pressure gauges. The gauge is fixed to a oil resevoir which is acted on by a varying weight via a spindle 1/10 square inch in area. Weights are added in increments of one pound, each of which should increase the reading by 10 p.s.i on the gauge. (1 lb = 454g, 1 inch = 2.54 cm). A test certificate issued by David Kirkaldy in 1877 for brick tests performed for The Midland Railway - Kettering and Manton Branch. (1) "Manton" (4) "Glaston 0." (2) "Fox-Cover" (5) "Glaston K."
Aucland's yard at that place. The bricks marked "Glaston O"
were I believe marked by "Brooks"